Today I bring you what I think is the best high street contour and its an absolute steal. Back when I started this blog in 2013, contouring wasn’t even a thing. It’s not something I do on a daily basis (aint’ no body got time for that). BUT, for a night out, its a must for me now. I mean, why would you not want to be able to shave 10lbs of your face? So today I thought I’d share with you 3 reasons you should try the Barry M contour stick that I recently picked up, because I love it so much and needed to share it with you. I started out with the sleek contour and highlight, then upgraded to the Contour Cosmetics palette. However, Since I bought The Barry M contour stick, Its always the one I reach for. So the biggest factor in all of this for me is the price, in my opinion its an absolute steal at just £7.99. For this, not only do you get the contour stick, but also the highlighter. If I’m honest, I don’t really use the highlighter, purely because I am so loyal to my collection concealer and use this as a highlighter too. however, whether you use the highlighter or not, when you compare this to the Contour Cosmetics palette at £28, it really is worth it. The application of this is effortless. If your a beginner and worried about applying to much product. Then you NEED to try this. We all know that time you applied to much with a brush and have the dreaded muddy face. HAHA. It really isn’t a good look. When I use the Barry M contour stick, I don’t have this problem at all. For my cheek bones, I tilt the stick so that I am using the edge and draw a thin line. Under my jaw I use it flat, because, well you know, the chins need covering. I also use a flat top brush and apply it directly to this and blend that way. It really is so easy to work with. The problem with a lot of contours is the colouring. Some are too dark, some too orange and some too shimmery. With this stick being a cream product it is very important to be careful of applying too much, but as long as you bear that in mind you can’t go wrong. I tend to apply one layer and blend and then top up as and when. 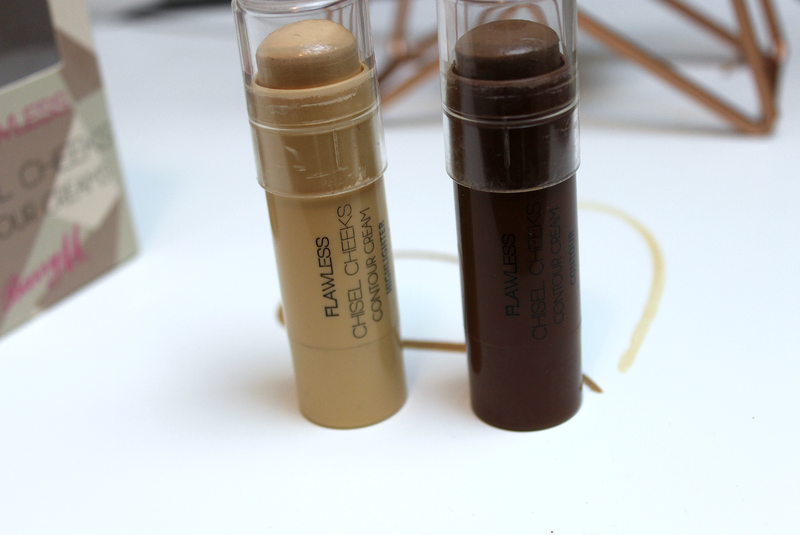 The colouring is perfect for me and I am quite pale so if you have a darker skin tone you can just apply more. In conclusion, I would highly recommend this as an affordable and easy to apply contour. Although, like I said, I don’t personally use the highlighter part, the contour itself in my opinion is definitely worth the £7.99 and it fits perfectly in all of my makeup bags unlike huge contour palettes.